The Trump administration's delay in sending real aid to Puerto Rico after Hurricane Maria is a distasteful display of colonialist racism. But it's par for the course: our citizenship has always been second-class. 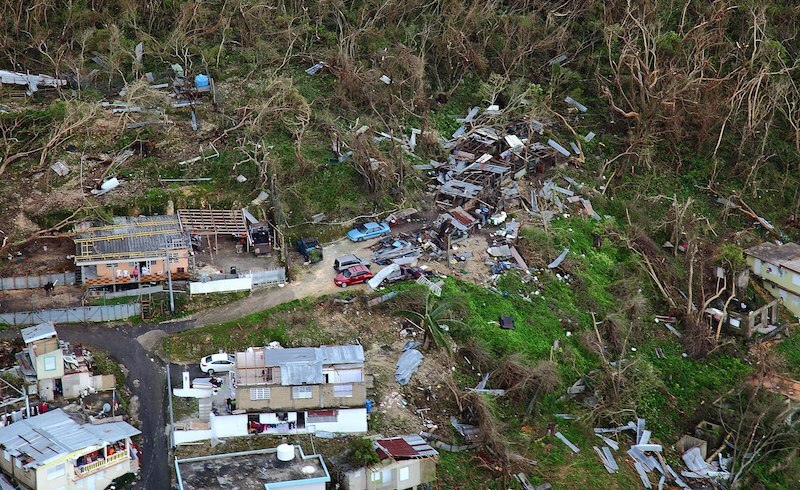 Destruction in Puerto Rico following Hurricane Maria. via Wikimedia Commons. So it is no coincidence that, weeks after Charlottesville, and the many other spectacles of implied and literal violence that have marked the Trump reign, the mainstream media has apoplectically ping-ponged between the Colin Kaepernick-inspired National Anthem kneeling protests and the tragedy of tens of thousands of Puerto Ricans root-shocked and desesperados by a landscape of twigs where Ceiba trees grew, zinc roofs shattered into shards, and a simmering, rising tide of noxious, contaminated water flowing through what were once quaint Caribbean towns. The kneeling protests staged by African American athletes were a silent rejection of internal colonialism, while the Shock Doctrine military-P3 complex that's about to overtake Puerto Rico is the end game of a century or so of external colonialism. While we need to continue to fight for debt relief, the calls for a military presence — more to help restore infrastructure than to stop and frisk looters, imagined and real — and massive federal investment for the rebuild will be made, from my heart at least, reluctantly. The absolute destruction that has been visited on the island has temporarily rendered pro-independence politics untenable. Of course they must reappear in time, but for now we have to insist that the U.S. take economic responsibility for miring Puerto Ricans in debt (with considerable help from the the island's political and banking elites) and putting them in the path of an extreme atmospheric event fueled by the protracted sluggishness to react to climate change and fossil fuel addiction. Ed Morales is an author and journalist who has written for The Nation, The New York Times, Rolling Stone, the Village Voice, and the Guardian, among many others. He is the author of Living in Spanglish (St. Martins) and The Latin Beat (Da Capo Press), and Latinx: The New Force in American Politics and Culture, forthcoming from Verso. He is currently a lecturer at Columbia University’s Center for the Study of Ethnicity and Race, and a fellow of a new working group studying the Puerto Rico debt crisis at the Center for the Study of Social Difference.